Would You Pay More Than $400 for a Link Statue? What If They Threw In a Horse? 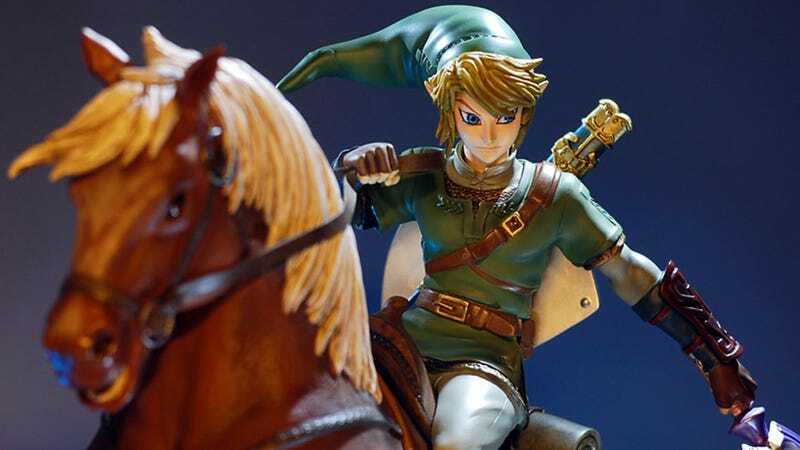 High-end collectible creator First 4 Figures continues its love affair with Zelda fans' money with its most expensive statue yet, the Twilight Princess Link on Epona statue. Standing 17 inches tall and cast in high-quality poly-stone, this hand-painted, hand-finished piece truly captures the spirit of the hero of Hyrule and his best lady, Epona. The standard version of the statue, limited to 1,500 pieces worldwide, will set a Zelda lover back $424.99, but wait, there's more! First 4 Figures is also releasing an even more limited exclusive edition of the statue to commemorate the 25th anniversary of The Legend of Zelda series. It's essentially the same statue sporting a faux bronze finish, making Link look like a member of Wetworks. This version is limited to 500 pieces, and runs $449.99. Both are available for preorder right now, but they don't ship until the second quarter of next year, so you have plenty of time to come up with a story justifying the extravagant purchase to your loved ones.